The Tirumala Venkateswara Temple is located on the Venkatachalam hills, Tirupati, which is in the state of Andhra Pradesh, India. 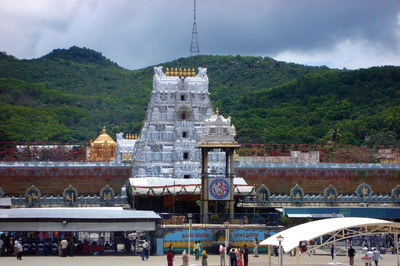 The temple hill is a part of the seven hills located at Tirupathi. These seven hills are collectively known as “Temple of seven Hills”. The idol at this temple is Lord Venkateswara, also called Balaji or Srinivasa. 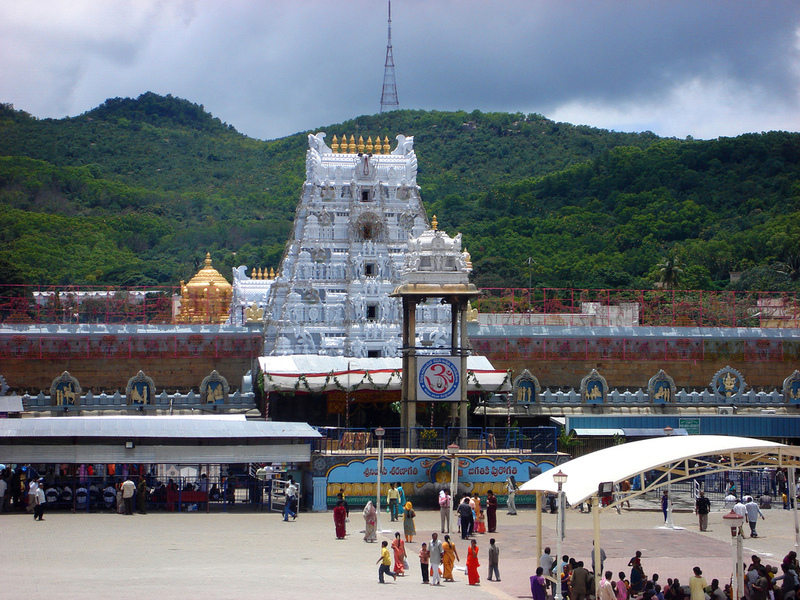 The Tirumala temple is the world’s richest temple and the World’s most visited pilgrim place. Everyday, 75,000 to 100,000 pilgrims visit the temple daily and during the festival seasons, nearly 500,000 pilgrims visit the temple daily which is a record to any sacred places in the whole world. The temples annual income is the highest income compared to any holy place in the world. The temple at several parts, such as the gates at the Lord Venkateswara’s idol is made with gold. The jewels used in the Lord Venkateswara’s idol are made of diamonds, gold, and gems. A large number of devotees present precious ornaments made of gold and diamonds everyday to the Lord Venkateswara’s idol. The value of the Ornaments gifted is not yet known. The temple was built in a Dravidian style and the year of the temples construction is not known clearly. But some scriptures say that the temple was constructed by Thondaiman (king from the Pallava Dynasty). Thondaiman first built the temple and the entrance gate, which were used in conducting the prayers. The major development of the temple took place in the 15th century during the time of Krishnadevaraya (emperor of the Vijayanagar Dynasty) rule. In addition, he donated the ornaments to the Lord Venkateswara’s idol, made of gold and diamonds. The temple is open in all the days, a queue system is maintained for the people. There are two ways to see the Venkateswara’s idol inside the temple, one is “Dharma Darshanam” (going near to see the Venkateswara’s idol), which is free of cost and takes about 10 hours time. Another way is “Sudarshaman”, which costs about 50Rs and takes about 3 hours, and “Nija Pada Darshanam” which costs about 100Rs. The “Brahmotsvaram” (a festival which is celebrated nine days at the temple), which is celebrated in September, attracting millions of devotees. “Vasanthotsavam” (a spring festival) celebrated on March and April and “Rathasapthami”, a festival celebrated on February, where the idol of Lord Venkateswara is taken out as a Procession on the chariots. Laddu is the tastiest sweet served at the temple, in addition, the curd rice and tamarind rice is a special attraction. A large number of devotees shave their head at the temple premises which is a tradition at the temple. The shaved hair is sold by the temple authorities, which is used in cosmetics etc. Tirupathi being the major pilgrim city in India is well connected by all means of transportation from the major cities in India. Paid and free accommodation is available, people can choose according to their choice. I would like to have plain photograph of Tirupati Balaji. As sevral time I tried to see the photographs of Tirupati Balaji God. But I was never able to see the photographs of God Balaji without any ornaments. Can you Send it ?